Our youngest members are called Rainbows and are aged between 5 and 7. They meet in the early evening and their programme includes four parts – Look, Learn, Love and Laugh – and they do plenty of that! Brownies are aged between 7 and 10 and meet weekly in term time usually in the evening. To encourage leadership skills, they work in small groups called ‘Sixes’ led by a ‘Sixer’ Brownie. Guides meet as a Unit and complete activities of their own choice in small groups called Patrols led by a Patrol Leader. Guides are aged between 10 and 14. They work on individual badges and themed activity packs called ‘Go For Its’ within their Patrols. Senior Section members are aged between 14 and 25. They can be in Ranger Units arranging many of their own activities. 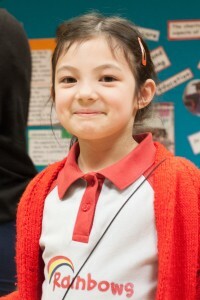 Many become Young Leaders helping at Rainbow, Brownie or Guide meetings. When they become 18, many Senior Section members chose to undertake Adult Leadership training. Girlguiding Middlesex North West has over 400 adult volunteers – maybe you would like to join us? Being a leader of a unit of young members aged between 5 and 25 (see opposite for details) is open to any female over the age of 18. Men are welcome as Unit Helpers. Whether you have been in Guiding as a child or would welcome the opportunity to join us now we would love to hear from you. Full training is given and leaders are supported by a local commissioner (lead volunteer). If involvement with a Unit is not for you at the moment, we may have other opportunities locally for example treasurers, secretaries, event organisers. It is open to all adults who have an interest in the Girlguiding movement, be they current unit leaders, ex leaders or those who at some time in their life have been a Guide, Brownie or Rainbow. We also welcome those who have never been members but would like to support Girlguiding in their area. In Middlesex North West we have seven Guilds covering the areas around Belmont, Harrow, Heathrow, Pinner, Ruislip, Northwood, Uxbridge. Each Guild has its own programme of activities, outings, etc as well as joining together at times with all the other Guilds in our County. Trefoil Guild also provide help when needed for Rainbow, Brownie, Guide and Senior Section events at which their experience and support is welcomed by Girlguiding Leaders in our County.